UKIRIGURU, TANZANIA--(Marketwired - December 12, 2016) - Tanzania recently became a partner of the Next Generation Cassava Breeding project (NextGen), joining Nigeria and Uganda in the global effort to improve cassava breeding in Africa. This partnership is expected to enhance the project's efforts to improve livelihoods for African cassava farmers. "Partnering with NextGen should help us develop tools to address biotic stresses like cassava brown streak disease, cassava mosaic disease, and cassava green mite, and improve cassava root yields that will serve to increase cassava production countrywide," said Heneriko Kulembeka, cassava breeder and NextGen coordinator in Tanzania. "The NextGen project will assist in determining good parental lines for different traits of interest." 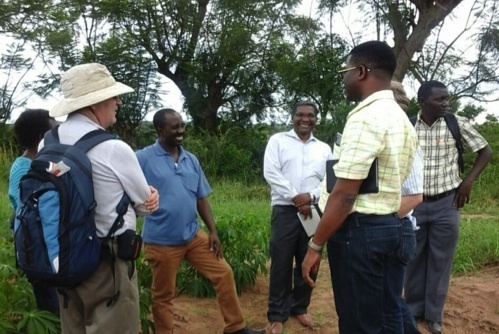 "Tanzania has one of the foremost cassava breeding programs in Africa," said Chiedozie Egesi, NextGen manager of the Cornell University-led project. "Because Tanzania shares African cassava germplasm, they will benefit from the genomic predictions that NextGen has already developed, use of the NextGen Cassavabase database and capacity for improved phenotyping." Cassava is a vital crop in Tanzania, second only to maize in volume produced. More than 80 percent of farmers in the country grow cassava, producing about 4.5 million tons of cassava roots annually. About three-quarters of the crop is used for human consumption. The rest is used for livestock feed and industrial purposes. A widely preferred and hardy staple, cassava is often stored in the ground and locally processed as a source of food in times of famine. Cassava farmers face many challenges raising their crop. Tanzania loses an estimated 2.5 million tons each year to cassava brown streak disease, cassava mosaic disease, and cassava green mite. There is poor access to improved planting materials and processing technologies, limited use of fertilizers and herbicides, and low investment in cassava research and improvement. To address these challenges, researchers in Tanzania's Ministry of Agriculture, Livestock, and Fisheries (DRD) will collaborate with scientists on the NextGen project largely through ongoing efforts at the Lake Zone Agricultural Research and Development Institute (LZARDI), the oldest agricultural research station in Tanzania. LZARDI scientists are well prepared to contribute to the efforts of NextGen partners through cassava-related research that includes breeding and improvement, molecular marker-assisted breeding for disease resistance, processing and product development, and agronomy studies. The NextGen Tanzania team consists of Kulembeka; Kiddo Mtunda, cassava breeder and coordinator (coastal Tanzania); Geoffrey Mkamilo, national team leader of the Cassava Research Program in Tanzania; Kasele Salum, assistant cassava breeder (Lake Zone); and Caroline Sichwale, assistant cassava breeder (Eastern Zone). NextGen is a global partnership led by International Programs in the College of Agriculture and Life Sciences at Cornell University, in collaboration with the International Institute of Tropical Agriculture and National Root Crops Research Institute breeding centers in Nigeria, the National Crops Resources Research Institute in Uganda, DRD in Tanzania, the West African Centre for Crop Improvement in Ghana, Makerere University in Uganda, and the Boyce Thompson Institute, USDA-ARS, and the U.S. Department of Energy in the United States. The Cornell-led project is funded by a $25 million, five-year grant from the Bill & Melinda Gates Foundation and the Department for International Development of the United Kingdom, and is in its fourth year.